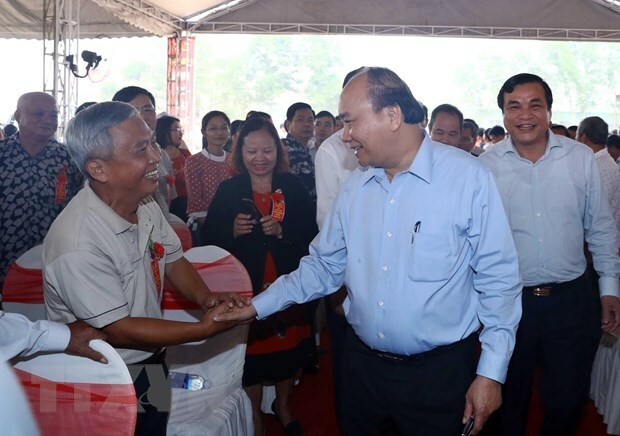 Hanoi (VNA) – Prime Minister Nguyen Xuan Phuc attended a ceremony to recognize Que Phu commune, Que Son district, the central province of Quang Nam, as a new-style rural area on March 23. Addressing the ceremony, the PM lauded the great efforts by the Party Committee, authorities and people in Que Phu commune which helped the commune meet all 19 criteria of a new-style rural area after eight years. He asked the local Party Committee and authorities to continue paying attention to raising locals’ living conditions, which, he said, is the ultimate goal of the new rural area building movement. The PM reminded the commune to strengthen the local political system and build a green, clean and beautiful living environment, and ensure security and order for local residents. It is also important to pay due attention to caring for the elderly, people with disabilities, orphans and policy beneficiaries. According to the commune’s steering board for new-style rural area building, over the past 8 years, the commune had mobilized over 61 billion VND (2.63 million USD) for the work.